Online store Gadgetolik announced an update of its survival collection to offer a new 20-in-1 multipurpose tool, a gadget featuring a bottle opener, multiple screwdrivers, wire stripper and many other functions. Gadgetolik, an online store specializing in tools and accessories, announced a new 20-in-1 DIY tool for anyone looking for a reliable multipurpose survival gadget. 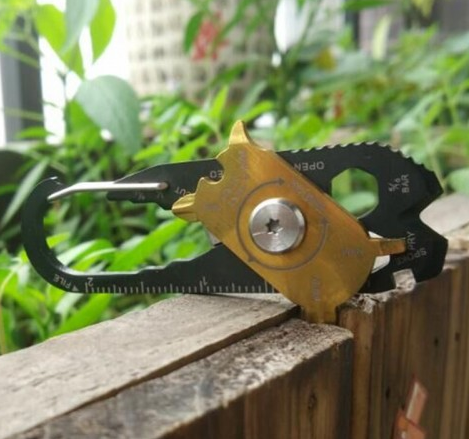 Ideal as an outdoor or survival tool but also suitable for everyday use, the new product features a bottle opener, measuring ruler, wire stripper, wrench, different types of screwdrivers, nail cleaners, and many other functions. More information can be found at https://gadgetolik.com/20-in-1-all-purpose-diy-tool.html. Multipurpose tools are widely appreciated for their practicality and convenience, often being smaller and more portable then the single-purpose tools they replace. The new 20-in-1 multipurpose gadget from Gadgetolik was designed as an alternative to other similar gadgets featuring only 3, 5 or 10 different functions. The 20 functions of the multipurpose tool are the following: measuring ruler, wire stripper, bottle opener, quick release clip, box opener, 1/4″ wrench, small Philips screwdriver, small flat eyeglass screwdriver, medium flat screwdriver, large flat screwdriver, bicycle spoke wrench, nail cleaner, razor-sharp cutting blade, medium Philips screwdriver, 5/16″ wrench, pry bar, 3/8″ wrench, 1/2″ wrench, 9/16″ wrench, and file. At just over 3” long and 1” wide, the multipurpose tool can be easily carried in any backpack or travel bag. The durability of the materials make the gadget safe to use in any type of environment, from a suburban backyard to a humid rainforest. With the latest announcement, Gadgetolik continues to update its wide range of high-quality products at accessible prices. The website also offers a variety of car care products, including seat back organizers, multifunction storage boxes, parking camera and Bluetooth kits, and various others. Interested parties can find more information by visiting the above-mentioned website, as well as at https://gadgetolik.com.